Israel’s Prime Minister Benjamin Netanyahu was surprised by a forthright expression of support for the Jewish state from Russian President Vladimir Putin during a meeting last month in Moscow, Israeli daily Ma’ariv reported on Friday. Netanyahu had flown to meet the Russian leader in a last minute effort to prevent an interim nuclear deal between Iran and world powers from being signed. During the meeting, Netanyahu asked Putin to withhold support for the convening of a Nuclear Non Proliferation Conference the stated purpose of which would be to rid the entire Middle East of nuclear weapons, according to the report. In 2010, President Barack Obama first announced plans for the convening of this international meeting. However, due to Israeli pressure, America pulled its support for the initiative late in 2012. Russia was and remains one of the Conference’s chief backers. Ma’ariv said that in his meeting with Putin, Netanyahu explained that a meeting with effectively the chief aim of dismantling Israel’s nuclear capability – the existence of which has never been confirmed by Israel – will harm the country’s vital national interests. Netanyahu went on to explain to the Russian President that there will only be a place for the convening of such a meeting after peaceful relations have been established between Israel and Arab countries across the Middle East, Ma’ariv said. At this point in their hour-and-a-half conversation, Putin surprised the Israeli Premier. “Russia will slow all efforts to convene the conference,” Putin promised Netanyahu, according to Ma’ariv. Putin went even further, making it clear to Netanyahu that Russia will not do anything to harm Israel. 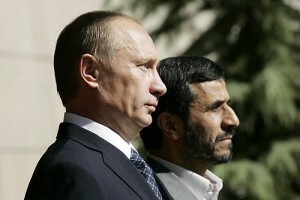 He added that despite the alliance between Israel and the United States, Russia stands by Israel. The reported comments come as somewhat of a policy about -face, as four short months ago Putin stated that Israel should dismantle its nuclear capability. However, the devil is in the details of this apparent change in the official Russian position vis-a-vis Israel’s nuclear program. Specifically, Putin told Netanyahu that Russia supports the ‘slowing’ of efforts to convene an international Nuclear Non Proliferation Conference, not a complete cessation of such efforts. In short, while Putin is taking the Israeli position into account, he fully intends to keep all options on the table. Read other articles of mine that have been published by the Algemeiner here. ← Love Me Don’t: Why Weren’t the Beatles Allowed to Perform in Israel?